...annual holiday leftovers challenge! Use scraps of wrapping paper, parts of holiday cards, recycle gift tags or bits of ribbon on a paper crafting project. We all have plenty of it laying around after all the holiday excitement and this is your chance to incorporate some of those pretty little things into an amazing piece of art! Now, I must add here, we had more than one box of these little yummies floating around the house this Christmas Season (Woolies had a special on them ;-). This is just the only unopened one I had left! I also checked on the box because I had no idea if these chocolates were an Aussie thing, but it seems they are made in Canada, so I am sure my O/S stamping friends have heard of them before too. I decided to use the leftover gold foil from the chocolates to add to my creation. With some ingenuity they could also probably be a chocolatey scratch and sniff accessory! Accessories: Both sides of the Background Basics: Diamonds Impression Plate (PTI), Embossing Pad Kit (PTI), All three of the Beautiful Blooms II #3 Die Collection (PTI), Fillable Frames #9 (cut down to size)(PTI), Pure Poppy Felt (PTI), Dimensionals (SU), Mini Glue Dots (SU), Tombow Adhesive (Penwa), Gold Cord (SU) and recycled Gold Foil (Ferrero Rocher chocolates). I had fun making this card because every time I get my Cuttlebug out the kids flock to my craft table and ask if they can run various things through it. I have run the recycled gold foil dots through the Cuttlebug, to make them nice and flat for the card too. Well, Thanks for dropping by today. I hope that you all had a lovely peaceful Christmas, and very best wishes for a happy 2011! (Blogged to: Modern Love - David Bowie, Don't Leave Me This Way - The Communards, and Absolutely Fabulous - Pet Shop Boys). Genius! And your card is super gorgeous! Your card is DELIGHTFUL! 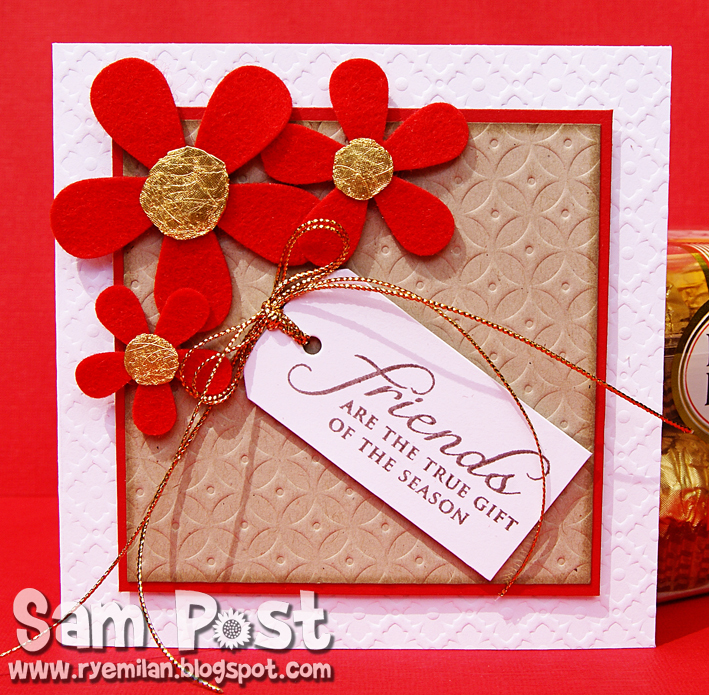 LOVE those flower centers and the embossing is FAB! Great idea! Love the look of the foil pieces at the centers of the flowers. Too clever! Love your little project. How good was that Woolies special - I bought tons of them and only ended up gifting one box - guess who has eaten the rest lol. One box left and I'm trying super hard not to open. Hope you all had a wonderful Christmas. Look forward to catching up again soon. I am positively addicted to those little hazelnut yummies! I bought a 3 pack a few weeks ago at the supermarket, and they were gone before I left the PARKING LOT! Love how you used them for the center of the flowers...who needs brads? 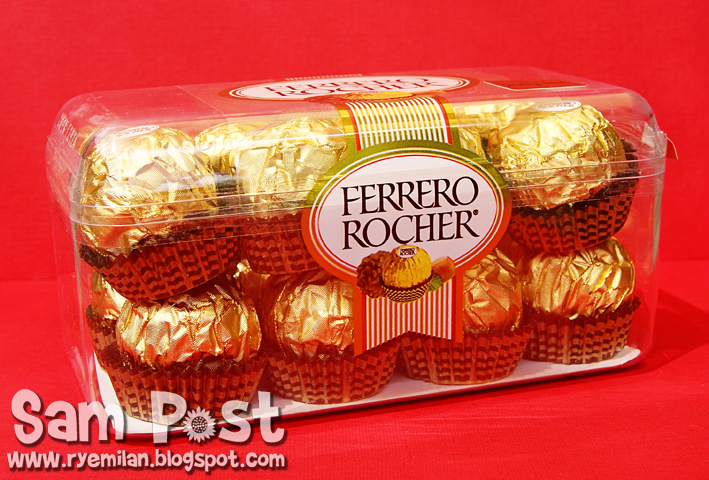 Now I have a new excuse to buy more Ferrero Rocher!! Great job! Terrific card!! 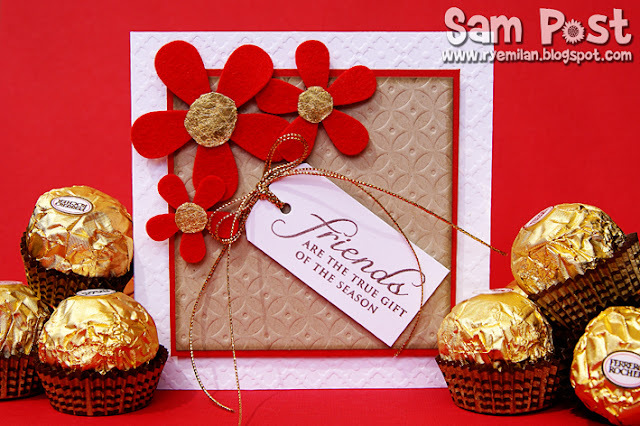 Love that you used the foil for the centers of the flowers. What a lovely card! So Christmasy! Welcome to the blog Hop- you've entered with a perfect card! Fabulous card - GREAT staging! So clever you are!! Gorgeous cards! HOW fun; great card and I just realized I did NOT get any of these to eat this year -- they're a huge fav of mine! Being from Canada, I have a dish full of these little gold nuggets just staring at me and didn't think of using the foil wrapper! Clever girl....! The card looks gorgeous - just as rich and yummy as the chocolates that inspired it! Love the red felt flowers and the embossing. IKWYM about the cuttlebug - mines a kid magnet too ;) Chat soon. haha that is a funny but great way to recycle! Lovely project and great photography! Hi Sam, I LOVE your yummy card! What an awesome use of your chocky wrappers. Ooo, I bet it smells so delicious!! Makes me think of some those leftover little caramello easter eggs that I have hidden in my wardrobe (so Miss 7 can't see them and start asking 'awkward' questions about the Easter bunny!) - maybe I should 'recycle' the wrappers B4 they are out-of-date LOL! Very beautiful card....and I love the centers of those flowers. Very clever! Wow! I love,love,love it. If you don't mind I think I will try your idea. Gorgeous creation! Those are some of my favorite chocolates. They are available here in California. Costco sells them at a great price. Very clever to use the wrapping for your project.